If you would also like a face painter to attend your event, just ask Auntie Julie. Add that special extra touch to your party with face painting or arm tattoos. Whether you prefer a butterfly, a monster or a vampire, Nina can transform you into almost anything you can imagine! A fun addition to a party, or corporate funday that adds that special extra touch. 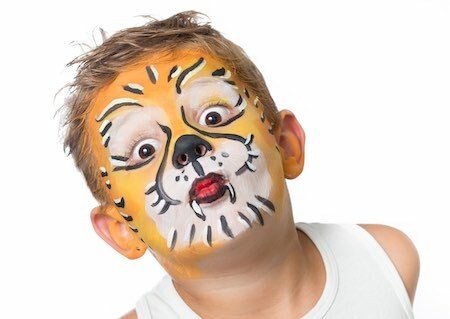 Following codes of practice to provide clean, safe, fun faces with quality materials, all Auntie Julie’s face painters are professional, experienced and trained to the highest standard. All products are dermatologically tested, hypo allergenic and water-based. The photos belong to Nina, her preferred painter, but when Nina is not available another face painter can be arranged. Nina will cover Watford, Rickmansworth, St Albans, Hatfield, Welwyn Garden City, Harpenden, Enfield, The Chalfonts, Hillingdon, Ruislip, Amersham and Stevenage. If you book a party with Auntie Julie just let her know if you would like Nina to come along as well. Firstly I would like to thank my husband Steve and sister Vanessa without whom my children would never be fed or dressed at the weekends. Next I would like to thank my children, Peter, Anna and Michael without whom I would never have ventured on this incredible journey. In 2002 I was introduced to the Watford Association of Magicians. It was a major turning point for me magically, leading me to local and international awards for stage magic, as well as membership of The Magic Circle. My thanks go to magicians Tim Shoesmith, Andy Clockwise and Terry Seabrooke, for their unwavering support. This book would not have been the same without the illustrations by Danielle Taylor, http://rionawolfheart.cghub.com Danielle had already finished her associate’s degree course in Fine Art and Illustration at West Herts College, Watford Campus, but still took on this project. From some basic sketches and doodles she has transformed this book from a simple set of do’s and don’ts to something that will be fun to refer to time and time again. My final thanks go to you, the parents, who have dedicated their lives to their children. They will remember to thank you one day. Julie Carpenter, aka Auntie Julie has been performing at children’s birthday parties for over 10 years. She was born and brought up near Watford, Hertfordshire and still lives only a stone’s throw away from her Mum and twin sister. Julie always loved to sing, joining the church choir at 10 yrs old and an amateur dramatics group at 15. She left school after her A levels and joined the Metropolitan Police. Rather than re joining this career after having her three children she decided to enter the world of children’s party entertaining. Initially she worked with a partner, running games and disco parties, but was soon ready to branch out on her own, as Auntie Julie. Auntie Julie quickly became a well known trade name and company within local councils, school and playgrounds. She also started to work for POD, a charity that organises shows in children’s wards at hospitals all around the country. Julie has always offered advice to parents on how to provide the best possible party for their children. This book puts all that advice into one place for easy reference. “Never again,” is what my sister said when she chose to run her boy’s birthday party on her own. She thought it would be a doddle. The boys hunted in a pack around the house. Every toy came out, the garden was wrecked, the food flew and the noise abatement officer was called in. What about the boys’ parents? No help what so ever. What went wrong and how can we stop it happening again? Running a party is about being in control. If you plan properly then keeping control is easy. Leave the day to chance and you will have one sticky mess of a party on your hands. This book leads you through your party, and out the other side to a glass of wine and a well deserved takeaway supper. It takes you from those first phone calls, through the party day and on to party bags and thank you letters. Follow this step by step survival guide for a stress free party you will be pleased to remember. There are three things which can really wreck your party. They will be referred to throughout this book but let’s take a look at them now. There is no easy way to say it. Adults who chat will ruin your party. If adults want to stay during the party, they have to keep quiet. Yes they are cute but they are also disruptive and impossible to keep still. It only takes one small toddler running around the room to ruin your party. What is stuff? Loose balloons, whistles, hooters and party hats are the stuff of a nightmare party. Save them all for home time. Add to this list, toddler toys and games consoles and we are half way there. Food should remain in the kitchen until needed and extra drinks given discreetly, out of sight. The only stuff we need to survive this party is an entertainer, some happy smiling kids and a bit of preparation. When speaking to parents and carers I am often surprised at the order in which they book different elements of their party. It is fair to say that the entertainer is often the last major decision on the list. There are a number of things which will determine how your child rates their party, the most important is entertainment. So it seems best to start there. Finding the entertainer most suitable for you is the most important decision you will have to make. The best will get booked up in advance because word of mouth is so powerful in this industry. Parents know each other and as entertainers we know you talk about us. So listen to what others say and talk to the entertainers you like and have heard good reports from and make your decision, everything else can follow. Do I book a Magic Show or a Two Hour Party? Most entertainers will offer you a show or a two hour party. Some will only make the show available at certain times; others will have time slots which you have to fit into if you want to book them. 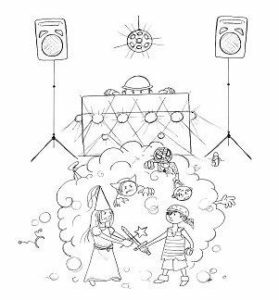 Assuming that your party is going to be two hours long, which is traditional and somewhat expected, a show will take up either the first or the last hour. Obviously you will need to feed them but it still leaves you with about forty minutes to occupy the children. The question is do you want to do it yourself or do you want to have a professional do it for you? Doing your own games session is harder than you might think but it’s not impossible and with a little planning you may find it fun. The advantage of having professional help is that it leaves you free to tidy away tea and sit back and enjoy the fun. Clearing the tea things is quick and easy if you don’t have tired children running around your feet. If you want the stress free party then my advice is get an entertainer. The difference in cost between the show and the party should not be that great so it is worth considering. Theme your party by all means, but avoid fancy dress. I think it’s fair to say that children don’t remember the theme of the party they remember the content. However if your child is really into the latest cartoon by all means find the decorations and cake that go with it. The problem with fancy dress is although the costumes looked great at home, they are often too hot for party games and the attachments can cause injury and sometimes become weapons. I have seen perfectly reasonable and well behaved children turn into monsters due to the catalyst of fancy dress. If you have never seen a rumble between pirates and princesses, and it’s on your list of things to see before you die, then maybe it’s the party for you. I suggest you avoid it. Yes it is better to find the right venue than exactly the right time. Being flexible with your date and time will make things easier for you in the long run. Let’s look at some of the common venues you can choose from and the advantages and disadvantages of each. Find a hall with plenty of parking, few stairs and good kitchen facilities. All halls will echo when they are empty but some are worse than others. Children love to be entertained but they get bored if they can’t hear properly and poor acoustics can lead to this. Also the sound of their own voice becomes more attractive if it can be heard rebounding off the walls. 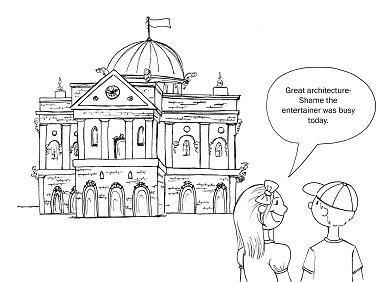 A good entertainer will limit the space to suit the numbers but try and avoid really large, high roofed, halls if you can. Large sports halls are notoriously difficult to work in. Make sure you can have the hall sometime before your party starts and also after it finishes. About half an hour either side is fine. You can certainly save money by having your party at home and with small numbers this is definitely worth thinking about. With ten to fifteen children a reasonable sized living room is enough and with the kitchen close at hand it can make tea easy. Perhaps you can put a few tables together or borrow one from a neighbour so all the children can sit to eat. Make sure all pets are removed and the room is clear of clutter. 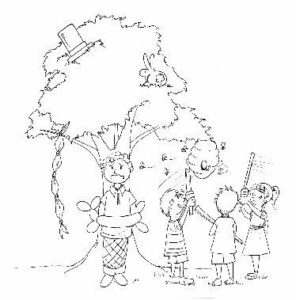 It is hard to make a garden party work well. There are a number of reasons why you will have trouble, the most likely being wind and sunlight. Oh yes, and sometimes it rains! The wind may seem inconsequential to you but even the slightest breeze can have your entertainer’s props flying. Ok so we can always send a child next door to retrieve a handkerchief but it doesn't do wonders for the concentration. Because the entertainer stands, the children have to look upwards. Your entertainer will be looking down at a sea of faces squinting up at a bright sky. If you do want to have a party in the garden keep it informal. How about a bouncy castle, with a balloon modeller or face painter? Do remember it will be a different kind of party, the drama and laughter of a live show will be missing. You could opt for a marquee. This is a move in the right direction, however your best option is to make a room available in the house, after all you may need it if it rains. With larger numbers it becomes increasingly difficult to manage a party at home. Halls can be inexpensive if you look around and although it is more effort to set everything up, once the party is over you can return to your nice clean home without the added stress of further cleaning. I have done some very good shows in soft play areas but in the main they are to be avoided. If the play frame is accessible then it is too much of a distraction. Any form of clutter, like loose play balls will make it difficult for children to concentrate. If there is a separate room, then great, have the show in there and let the children play after they eat. Entertainers are receiving more enquires for restaurant parties now. It seems to be a popular setting. My feeling is to save this type of party for the eight’s and above. It is hard to do a show for younger children as they are not ready for the close up magic they will enjoy as young adults. Also many restaurants will not allow an entertainer to play the music that is very much a part of a youngster’s party. This questions isn’t as obvious as it sounds. It may be your child’s birthday but who do you want to be there? Are you inviting your adult friends and their children, or is the party just for your child and their friends? There isn’t a problem either way, it’s just the way the party dynamics are set up is different. If the party is primarily for the adults, then hire two rooms, one for the adults and one for the entertainer and children. You may choose to have the party are at home in which case the kitchen usually makes the best second room. If the party really is just for the children, then I suggest you send the parents home to return at the end of the party. Some children, especially the three’s and four’s will still need a little adult support. It is important that the parents who stay know that the party is for the children and should join in with the spirit of the show. There is great pressure to invite too many guests. Your child may make demands and it does seem unkind to leave out children in their class but invite too many and you could be heading for disaster. In a house keep the numbers to fifteen unless you have a living room the size of a hall. If you have booked a hall, twenty five is a good number and certainly try not to go above thirty. Keep the age range small. As entertainers, we are used to dealing with children of different ages but the technique is completely different for a four year old and an eight year old. The best parties involve children in a small age range. 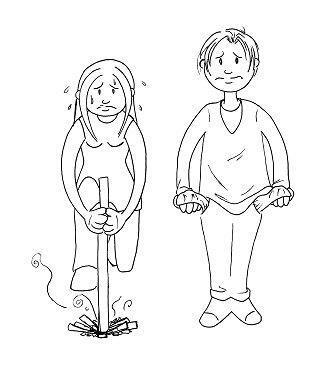 I am not suggesting that you leave older brothers and sisters at home; there are ways to get them involved. However harsh this sounds it might be better not to bring the two year old. A wandering child can cause a distraction and bring your party crashing down. If you do have to bring younger siblings then make sure they are supervised at all times. A big first birthday party is a tradition in some cultures. It is very much a family celebration, often with far more adults attending than children. The children tend to be extended family members with a large age range. You need an entertainer that can be flexible and adjust the show to the children presented to them on the day. What usually works best is a 40 minute magic show, a few games and some balloon modelling. Where possible, arrange a separate room or area for the show, as this will not disturb the rest of the party. Don’t abandon your entertainer with unsupervised toddlers. Little ones will still need a parent to support them. If the entertainer has to perform in the main area, then suggest that the guests turn their chairs and watch the show. A party lasting one and a half hours is sufficient for this age group. Parents can stay and watch the show with the children and then have a leisurely tea. A prolonged tea won’t provide enough structure for older children as they will become restless, but it does work well for the young. A good entertainer will have a gentle show aimed specifically at their age group. This is the perfect age for your children’s entertainer. Four to seven year olds behave in a very similar way and the two hour party format is perfect for them. Try to get parents to leave their children at the party, keeping the number of adults to a minimum. If you follow our rules you should have a perfect party. As children approach their junior school years they become more responsive and boys in particular have an interest in magic. Television programmes are made to encourage this interest and magicians aim their shows at this inquisitive age group. Inviting a magician to a restaurant works well in this instance. In a hall setting you will also find they are still prepared to play standard party games, like pass the parcel and musical bumps. If you are doing a dancing party for the girls don’t invite the boys. Sorry but dancing and eight year old boys rarely mix. The average eight year old boy has no idea how important dancing is going to be in a few years time. Family parties, Christenings, Weddings, and all other get togethers, follow the same rules as a party for a one year old. Try and give the entertainer some space and supervise the youngest children. Children’s disco parties don’t work. Dancing games work but discos on their own don’t. If your entertainer is going to come in, set up a few lights and a mixing desk and stand back and let the children dance, you are in for a shock. “Fighting on the dance floor” is a song more applicable to the children’s disco than any night club I’ve been in. Kids need structure. Music based games or circus workshops are fine, discos are not. There is nothing wrong with having an entertainer for a show and then a bouncy castle after tea. However be aware they are dependent on the weather. I have been rung at short notice by desperate parents needing some sort of entertainment due to inclement weather. 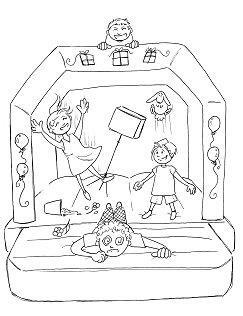 Again the bouncy castle lacks structure and the children will tire of it, some quite quickly, so make sure you have other things to hand. If you do have an entertainer, then switch off the castle and deflate it before the start of the show. Most entertainers are also balloon modellers. If you would like balloons for all the party guests then entertainers will often have packages that include a balloon for home time. Making thirty or forty balloons during a show can be time consuming and boring to watch, so arrange for the balloons to be made either before the show or during the food break and then put aside for later. No one can paint one child’s face and entertain twenty nine others at the same time. If you would like a face painter ask your entertainer to arrange one for you. Avoid disruptions to the show by using the face painter during the food and games sessions. 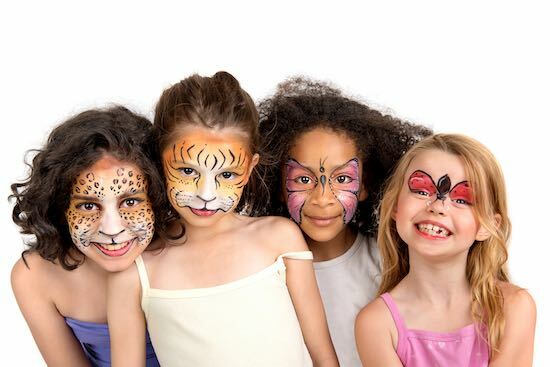 Some children are allergic to face paint so please let parents know that face painting is being offered at the party. You need to find your entertainer at least eight weeks before the party. Discuss with them times and dates and then book a venue. Make sure the venue has sufficient parking. If you want to order a cake or party bags, do that now. With these basic things organised you can sit back for a while. Things start to hot up nearer the time. Now you need to send out your invitations, with clear instructions and directions if needed. You need, date, time, venue and RSVP details. Ring your entertainer. Make sure they have directions to the venue. Confirm your guest numbers . Call the hall key holder. There is nothing worse than finding out problems with the venue a day before or worse still on the day of the party. Of course you need help on the day but avoid having too much. Usually immediate family is enough, you will find if you have more they will have nothing to do and will end up talking and disrupting your party. Reserve a parking space for your entertainer. They are likely to have a lot of heavy equipment to bring in. Talk to your entertainer. If it is a hall they use regularly then they will already know how best to set it up. Set the food tables up near the kitchen area. If at the start of the party children make a bee line for tables, simply stop any accidents by blocking the area off with a few chairs. Put the entertainer at the opposite end of the hall to the food. If possible place your entertainer away from the toilets or the entrance point. Give your entertainer as much room as possible. Around 25 foot square should be enough. Tie a couple of balloons to the entrance of the hall, especially if it is hard to spot from the road. All other balloons should be tied high enough to be out of the reach of the children. There should be no loose balloons in the hall. Any that come loose should be removed and placed out of sight. No guests should be allowed to play with any balloons during the show. Some halls are used by several groups. Cover or remove anything the children shouldn’t play with. This includes play equipment and things like table stacking trolleys or highly piled chairs. Also avoid things like hooters or party poppers; they cause unnecessary noise and mess. They also frighten some children, and it takes time to build their confidence up again. Most magicians will insist on working inside. 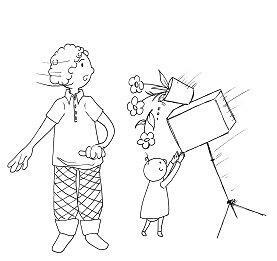 Performing in the garden is riddled with distractions, and the sun can be too hot for the children, putting them at risk of sunstroke. It is also unfair on any livestock the entertainer works with. Make as much space for your entertainer as possible. Remove all toys from the party room and make upstairs rooms out of bounds. Supervise trips to the bathroom. If guests arrive early ask them to sit at the side of the hall until the party starts. No one wants them running around and causing an accident. The entertainer will usually put some music on as the guests come in and settle. Most children over 5 can be left at the party. If your party is for younger ones they may still need a parent to support them. Encourage these parents to get involved in the show. 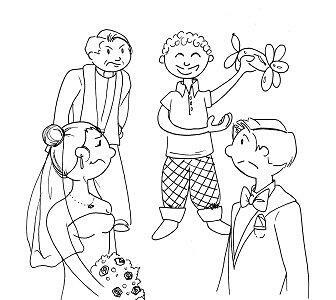 A parent ask may to leave other children at the party. I would suggest refusing. You have planned for those invited and it is unfair for them to take advantage. Above all do not let a parent leave a toddler with you. You do not have time to deal with him and your party could be ruined. If a young child has to stay then make sure the parent supervises them at all times. Don’t be fooled into letting an older child stay to look after a toddler sibling, they need an adult. Encourage parents with uninvited toddlers to go home. The more toddlers the less control you will have. Younger siblings of the birthday child need a designated adult to look after them, as mum and dad will be busy with the party. Give any older children a responsible job, organising the presents and taking down contact numbers are always good. Don’t allow older siblings to dip in and out of the party. They are either in or out. Don’t let them sit in the corner playing on the Game Boy. The more they feel they are a part of the party the better they will behave. Make sure they understand that the show is not for them. I do believe that my shows work for all ages but they are obviously aimed at the majority. Make sure your older child understands that it is not clever to shout out during the show. It’s not that we can’t deal with the interruptions; it just ruins the show for the youngsters. If the children arrive straight from nursery or school give them a quick drink and plain biscuit as soon as they arrive. The sugar boost will tide them over for the next hour before they eat. Place a table next to the entrance for presents. This is also a good place for parents to put their emergency contact number. Do not let the birthday child open any presents until after the party. Take any presents from the latecomer at the door and settle them down with the entertainer. Do not disturb the birthday child during the show to greet the late comers. This is especially important with relatives who arrive late. Granny can ruin the ambience of a show by greeting her grandchild. Also remind any late adults that the show has started and that they need to be quiet. Parents who stay have a choice. They can either sit with their child and join in with the entertainment, or find another room to have a chat with the other mums. What doesn’t work is allowing parents to sit in the same room as the entertainer and talk throughout the show. Avoid putting food out for the parents before you feed the children. You can bet, a pound to a penny, one will start a domino effect of disturbances by either taking food to their child or the child will see them eating and will head straight for them. The other parents will soon follow suit and quickly you will have lost control of your party. Put Nanny and Granddad in charge of making tea and coffee for the parents. Avoid alcohol. Save that for after the party – you deserve it. The children should be encouraged to sit near to, but not on top of the entertainer. The entertainer will let you know whether they prefer the children on the floor or on chairs. 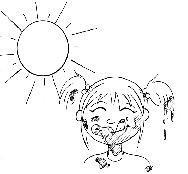 Make the entertainer aware of children with special needs or food intolerances. Children with special needs may need slightly more help, all entertainers understand about this situation, just let us know. We will do our best to make sure all the children get the most out of the party. I can’t say this is much of a problem, if the rules have been followed it is very rare for a child to create a problem that can’t be dealt with. However for some children sitting and watching is more than they can cope with. Some are too young, some immature for their age or have special needs, and some simply are naughty. No child should be allowed to interfere with the entertainers props, or allowed to run around. If a child can’t sit on their own, then an adult should be sitting with them. Crying toddlers should be taken out. Fighting must not be tolerated and hitting or spitting at the entertainer is totally unacceptable. Children who can’t behave in an acceptable manner should be removed by a supervising adult. If the entertainer stops the show and asks for a child to be taken out it is important to support them. This is what you have paid for. It is important that the ‘show’ works. If everything is in place, then you will have control and the entertainer can perform their show. The guests are sitting, the parents have either gone shopping or are watching, and the food is ready to be laid out. Sit back and enjoy the show. About a quarter of the party is taken up with tea time. For some children this is the highlight, for others it is a waste of playtime. About 25 minutes is usually enough time for tea. Lay the tables before the party starts but don’t put the food out until about 5 minutes before tea. Your entertainer will tell you when that will be. 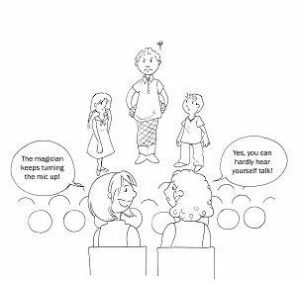 This will prevent, firstly hungry children leaving the magic show to graze at the tea table or more often, will prevent parents starting to feed their children in the middle of the show. Don’t put out squeakers, whistles or party poppers. No one will thank you for the noise, and children running around with plastic in their mouths will create a health hazard. Party hats are another hazard to avoid. Make sure you lay a place for any older children. Firstly they can feel left out and secondly it stops them wandering around. During tea all the children should be sat at the table. Don’t allow any child to get up, until the majority have finished eating, and the entertainer is ready to take over again. If one or two children start to run around, others will follow, control will be lost and the children will abandon your tea table. Party Boxes look great but often end up in the bin. They also tend to create more waste and tea will only last as long as it takes the child to sort through the box, and eat the sweets. It is much better to put out the savoury food first, let the kids choose what they want to eat, then after about 15 minutes bring out the cakes and biscuits. Avoid too much chocolate in the summer. It can get rather messy. Pink wafer biscuits and party rings are safe all year round. Home made jelly is often wasted so serve fromage frais in novelty tubes or packs as a clean and popular, time saving alternative. Getting the food right is very tricky. Each child can only eat so much so limit the amount you put out. By the same token some food will be more popular than others so be ready to put out more if you have it. Crisps/snacks – allow the equivalent of 1 packet of crisps each. Big bags of Wotzits, Quavers, Frazzles, and Pringles will all go down well. Don’t give the kids the packs, just place in small bowls and keep some back for top ups. Chocolate crispy cakes – avoid in the summer, make plenty in the winter Fromage frais – one tube/carton each – avoid the types that need spoons. 2 drinks each – all in non spill cartons or bottles – remember some water bottles for those who don’t drink squash. Parents will arrive in the last few minutes of the party. Your entertainer will be coming to a big climax, prizes are given out and suddenly the children are your responsibility again. Don’t lose your focus at this point. All you have to do is make sure every child has their party bag, balloon, prizes or anything else they are going home with. All this is important but nothing is more important than making sure that each child ends up with their parent or guardian. In the thousands of shows I have performed, I have never had a real problem, sure parents haven’t arrived for some reason or another but there is always a solution. However, there is nothing more frightening for a small child to see everyone leaving only to realise that they are alone. 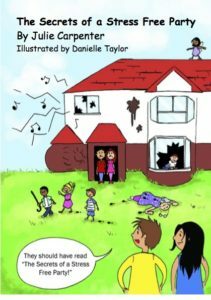 I have comforted children on numerous occasions who have felt their whole world is crumbling around them because their mother is five minutes late. Keep a look out, it’s easy to miss during the commotion.